“Nothing ends, Adrian. Nothing ever ends.” That is what Dr. Manhattan famously said in Watchmen, but in Doomsday Clock issue 7 it looks like things have changed. He says “But I was wrong Adrian, everything ends”. If we look through the lens of Dr. Manhattan we see a very different perspective of life, and that perspective and philosophy of Dr. Manhattan can help us figure out what his role is in Doomsday Clock. Spoilers for Doomsday Clock #7 follow! 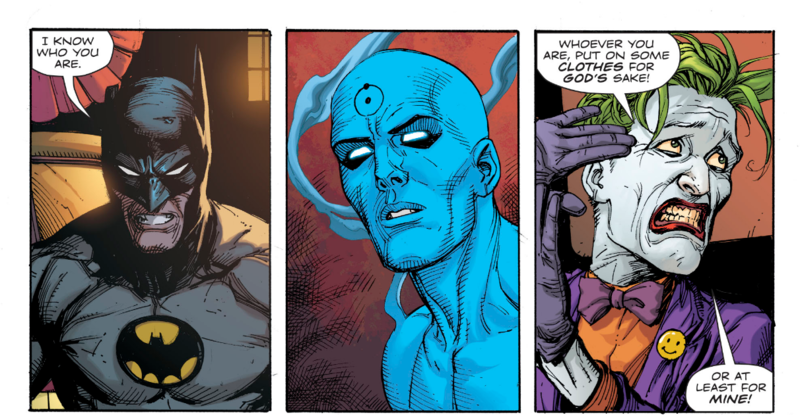 So we were finally graced by Dr. Manhattan’s appearance in Doomsday Clock issue 7. We’re starting to get a greater sense of what he has done. We know that he stopped Alan Scott from surviving an accident that would have lead him to become the Green Lantern, thereby stopping the foundation of the Justice Society of America. But why is Dr Manhattan meddling in the DC universe? To understand this, is to understand his philosophy. “We’re all puppets, Laurie. I’m just a puppet who can see the strings.” Dr. Manhattan views humanity in its rawest form. We are all bodies of particles, why define a higher understanding of life than that? Why try to assign a greater sense of meaning when there isn’t. We just are, there is no big plan, we just are. As humans define their lives by their past and hopes for future, Dr. Manhattan doesn’t see this. To him time is simultaneous, there is no past, present and future, it’s all happening at once. What if you one day decided to give up on the idea of having a past. You no longer had a past or a future, you just existed? How would your identity change when your life was no longer broken up by these phases? I think most people form their identity around what has occurred in their past, so if this ceased to exist, would you cease to exist? Now we can start to see why Dr. Manhattan is so detached from our normal concepts of what it is to be a human. His worldview is started to be turned upside down, he has a vision of Superman running towards him, throwing his fist at Manhattan, Manhattan can’t see anything beyond this. He questions if Superman destroys him, or if he destroys everything. Now he isn’t exactly concerned by this, just curious. So is this why Dr. Manhattan has been playing with the DC Universe? He talks about chess, how two players didn’t come out alive. We also see him step off a chessboard. Is he one of chess players, the DC Universe his game? Is he playing the characters like pieces, seeing what happens if he changes something, if the outcome remains? Because Dr. Manhattan sees humanity in its rawest forms he sees humanity as essentially machines. Our thoughts and emotions operating according to chains of cause and effect, action and reaction. He sees how humans operate, by pursuing their self-interests and pleasure, whilst mechanically avoiding pain. He knows that the very defining principle of all human actions are the emotion of fear and of hope. “I saw a vision of the most hopeful among them heading towards me. Now hopeless. And then…I saw nothing.” (He’s talking about Superman here). If we are defined by fear and hope, what are we once hope is gone? The very base of humanity no longer exists. Is that why Manhattan’s vision ends? There are only 5 issues left, so we will hopefully get some answers soon. We know that Superman will be a central figure to this story, but we haven’t seen a lot of Superman yet. However understanding Dr. Manhattan’s philosophy helps us understand his motivations, when you’re as powerful and curious as he is, there’s no telling what you can do! 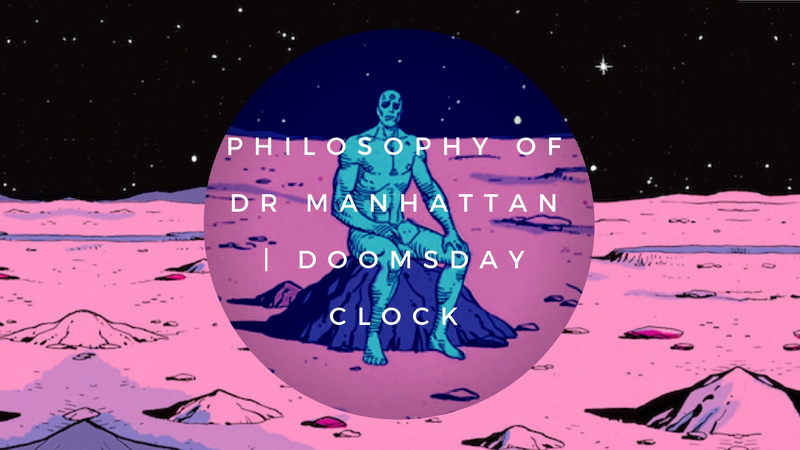 So what are your thoughts and theories about Doomsday Clock and the philosophy of Dr. Manhattan? Let me know in the comments below! You will have to wait a while to get the complete thing though haha,!